At around 3:00pm local time I got to Ushuaia, after almost 21 months since departing from Prudhoe Bay, Alaska. Right now the fact that I’m done with this trip is only starting to sink in. As far as I’m concerned, tomorrow is just another day, in that I’ll be drinking coffee when I get up. But of course it will be unusual in that I won’t be getting on my bike, I’ll be giving it and I a rest for at least little while. I’ve already received dozens of messages from folks congratulating me. Thank you so much for joining me on this journey! I can’t wait to see you in person. Stay tuned to the blog, I still have tons of pictures and stories that I’ll be posting. But for now, I’m going to go curl up in my sleeping bag, I didn’t sleep much last night! CONGRATULATIONS MATTO, COULDN’T BE HAPPIER FOR YOU! Congratulations, Matt! I am so very impressed! If you’d ever like to put an article in The Narthex looking back on your experience, let me know. In the meantime, I’d like to put a brief note stating that you completed your ride in the “Our People” section. Congrats again! Congratulations, Matt!! You’re amazing. I can’t wait to see the rest of your pictures! awesome man, it was nice following along. I would like to add a little note of thanks to your very special cast iron pan. Here’s to all the delightfully scenic, exhausting, tasty and sustaining meals that were cooked in it!!! We are really proud of you!! Glad we could be in on a tiny part of your journey…amazing that was already so many months ago! Blessings on you as you look forward to whatever the next step is! Cheers to you!! Looking forward to seeing you soon in Chicago. Felicidades! You Rock–BIG time! National Geographic were fools not to have tracked your story…But maybe it’s never too late! CONGRATULATIONS Matt!!! You did it. What is your next adventure? Hola amigooo, te felicito llegastes a Ushuaia estas muy cerca de Lapataia, tu espiritu no es el mismo para vos y me pone feliz que allas llegado a tu meta y quiero ver tu foto con el cartel de fin de la ruta 3- Bahia lapataia. un abrazo grande y disfruta este hermoso momento. Matt! I’ve been reading this blog, off and on, since you (and I) left Shriver. I’m 2 years into law school, but you’re at the tip of the world. Think we know who’s made more progress, and it ain’t me. Congrats, congrats, congrats, & thanks for chronicling. The vicarious living was awesome. Matt, you did it. Greg is not far behind, I hope to meet you someday and enjoyed your perspective of the long journey. You can add my congratulations to this long list. Well, done! Have a safe trip back to Chicago and enjoy the rest and relaxation after all those battles against nature. Congratulations Matt!!! Well done, termendous accomplishment! Thanks for sharing, look forward to the pictures. My Saturday mornings will never be the same. Matt, I’ve been following along since we met in Fairbanks. I want to congratulate you sincerely and from my heart. Few people know how difficult this sort of trip really is. You’ve done it, and no doubt you’re a better man for it. Much respect to you, my friend. Best wishes for life off the bike. I need to catch up on your exploits, so will be doing so as soon as I hit panam city in a couple of days. yes, I’m that far behind… colombia soon though, then I’ll see what likes next. savour that amazing feeling of having arrived, on your own steam, and all those kilometres of experiences within you. que no te olvides, que la asociacion de ciclista los pinguino, (mejor dicho) SUSANA CEBALLOS. te inmortalizo con esa foto en la llegada a ushuaia … que hermoso recuerdo, para que muchos puedan compartir .. un abrazo .. atte. 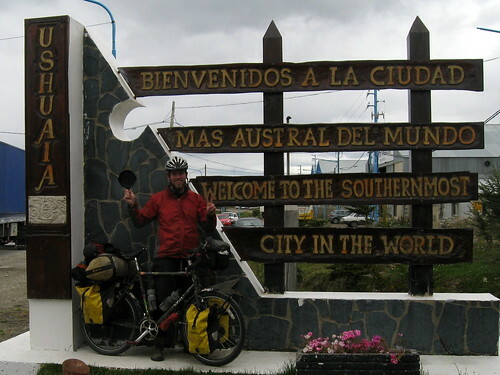 antonio…desde USHUAIA TIERRA DEL FUEGO ARGENTINA ..
Matt, I still remember when we met on Day 2 of this trip just South of Prudhoe Bay and camped near the Alaska Pipeline. I have been following and enjoying your trip while finishing up my own some months ago. Congratulations on this epic journey and Good luck with your return to the normal everyday life back at home! Hey Matt! Congratulations! I still don’t know how you got down there so fast – must have been a tailwind. It was great riding with you in Central America, except for the heat… and hills… We should do it again sometime. I should be rolling into Ushuaia in 7 months or so, and I’ll probably have a question or two for you along the way. Again, great job and good luck with whatever will come next.